Carpet flooring is still one of the most popular flooring products for business and homeowners. 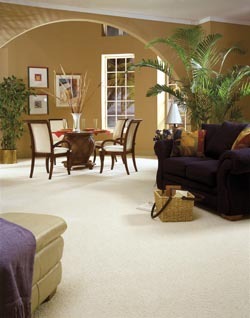 Our carpet options are versatile, comfortable, and add a warm and welcoming atmosphere to any room. Carpet comes in many different colors, textures, and styles, and there are a variety of carpet materials, such as nylon, polyester, and wool. The sheer variety of carpeting makes it suitable for almost any room in the house. New carpet is an easy and affordable way to upgrade your hole. Our numerous carpet options come in a variety of textures, designs, and patterns, including loop and twist. A carpet’s texture is an important part of its flexibility. Springy carpet flooring provides a safety boost to your home, allowing softer landings for children or people with limited mobility. Thick carpet offers a luxurious look to a living room or family room, while absorbing noise. Thin, soft carpeting provides eye relief from hard wall surfaces. Any carpeting can be the hypoallergenic choice, trapping dust, dander, and other irritants at floor level, away from your lungs and eyes. Your carpet purchase includes a free in-home measurement, so that you can be sure you’re getting exactly as much carpeting as you need. Our skilled, expert installation proceeds on your schedule, reducing the disruption to your home. All of our installations are performed by professional installers, who are highly trained and experienced at carpet installation. In addition, we offer the most comprehensive guarantee in the industry, so if you aren’t satisfied with your new floors, and let us know within 30 days, we’ll replace them at no cost to you! Contact us at <PHONE> for more information today. We proudly serve the communities of Decatur, Forsyth, Mt. Zion, Macon and Solomon, Illinois.